A quick look at the radar display will show you what weather conditions you can expect over the next few hours. If it looks like this, you might want to stay home and read a book. 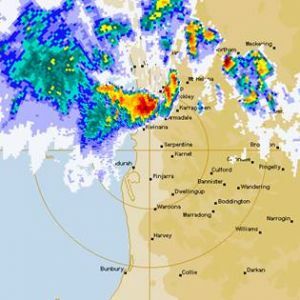 Click here for the BoM radar. Also provided by the Bureau of Meteorology, (BoM), the Local Waters Forecast gives you a summary of expected conditions in local waters for today and the next few days. Typically, these forecasts are updated twice each day, so take a look at the time the forecast was issued – things may have changed over a few hours. Click here for BoM Marine Hazard information. Click here for BoM Local Forecasts. If you are planning on fishing up close to reefs or rocky areas, you should check the tidal forecast. If there is a particularly low tide, you may want to think again about where to fish, particularly if the swell is up. Pay special attention to this if you are drifting or trolling. SeaBreeze is another option for obtaining a boating weather forecast. It offers a 7 day, hour-by-hour prediction of wind strength and direction, wave height and direction and tide predictions. The graphic representation is popular with many boaties. Click here for the SeaBreeze forecast.